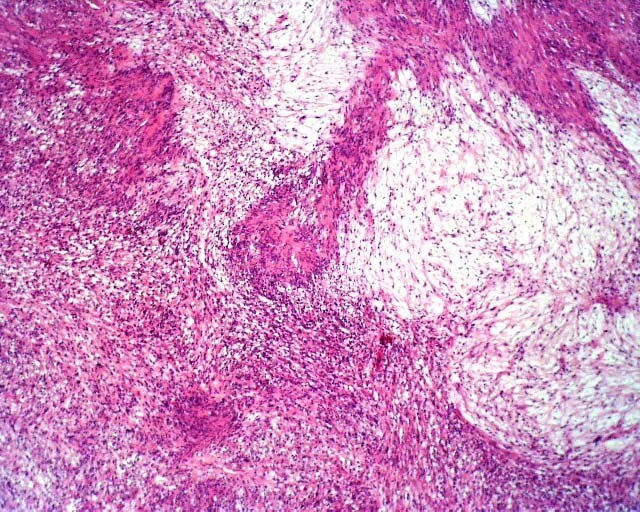 Microscopic features: Schwannomas are usually solitary, well circumscribed, encapsulated lesions, mostly confined to the subcutis. Multinodular lesions may be present in the dermis, this is known as 'plexiform neurilemmoma'. Antoni A area is composed of spindle shaped Schwann cells arranged in interlacing fascicles.There may be nuclear palisading. In between two compact rows of well aligned nuclei , the cell processes form eosinophilic Verocay bodies. Mitotic figures may be present (usually less than 5 per 10 high power field). Antoni B area consists of loose meshwork of gelatinous and microcystic tissue. Large, irregularly spaced, thick walled blood vessels are noted in Antoni B area. These may contain thrombus material in the lumina.